The murder of Senior Constable Maurice Moore on 27 September 1986 still resonates with the community of Maryborough so, on the 30th Anniversary of his death, the Blue Ribbon Foundation, through our Maryborough Branch, dedicated two memorial spaces and joined with the community for a public celebration of S/C Moore’s life and service to the public as a member of Victoria Police. 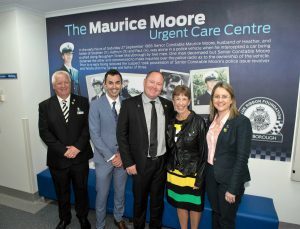 The first was a memorial garden in honour of S/C Moore at the front of the Maryborough Police Station and the second was the redeveloped Urgent Care Centre at Maryborough Hospital. With inspiration and donations from the Blue Ribbon Foundation the outdated Urgent Care Centre underwent a complete refurbishment to install better treatment cubicles, a central nurses station, secure entry and triage area, modern waiting room, additional egress points and new décor. It is now a state of the art facility that can provide first-class emergency care to the community of Maryborough and also provides better levels of security for medical and nursing staff. 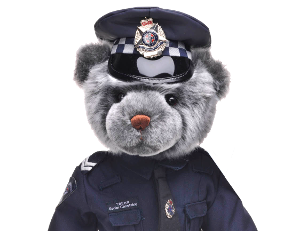 S/C Moore’s son Paul, who was four years old when his father died, is the Secretary of the Maryborough Branch and assisted with the project management of his father’s 30th Anniversary memorial day. We also thank the many tradespeople, suppliers and businesses who donated their professional skills and materials that assisted in the new building works.